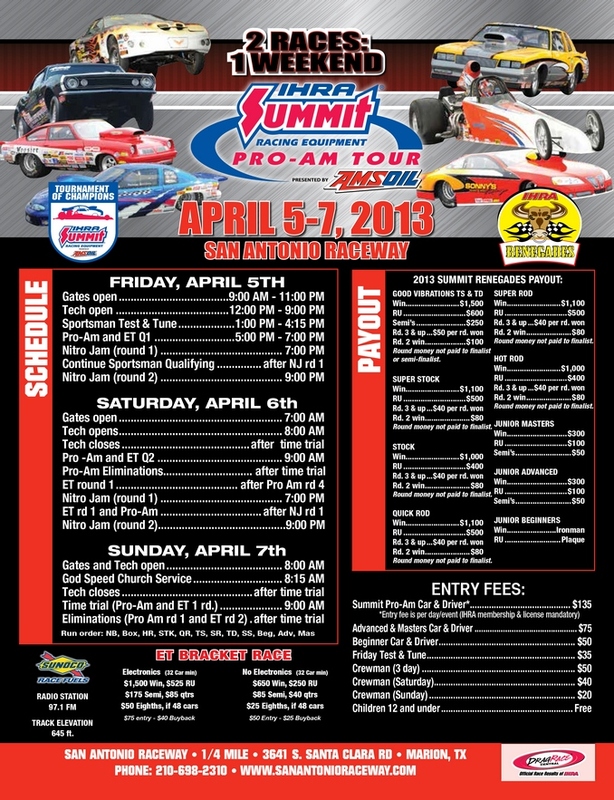 The 2013 IHRA Summit Racing Equipment Pro-Am Tour presented by AMSOIL travels to San Antonio Raceway for a Division 4 Renegades double-header and Nitro Jam April 5-7 at one of the biggest IHRA events of the year. This huge weekend will feature two full days of racing plus a special edition Nitro Jam Ironman for sportsman winners Saturday night and the opportunity to race in front of more than 10,000 screaming fans. The 1/4 mile showdown will feature a test and tune and one round of qualifying for sportsman on Friday, qualifying and Race 1 on Saturday and qualifying and Race 2 on Sunday. WHAT TO EXPECT: The second of four Division 4 Renegades double events will be held at San Antonio Raceway on April 5-7. Friday gates will be open from 9 a.m.-11 p.m. for parking and tech will open at 9 a.m. 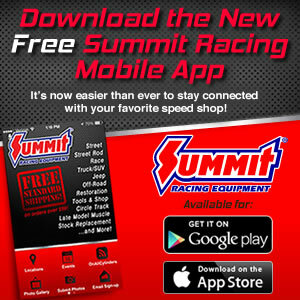 There will be a test and tune from 1-4:15 p.m. for $35 for those interested in participating followed by one time trial/qualifying session for all participants at 7 p.m. Day 1 of Nitro Jam will begin at 7 p.m. followed by the remainder of sportsman qualifying at 9 p.m.
On Saturday gates will open at 7 a.m. and tech will open at 8 a.m. and close following the time trial/qualifying session. Eliminations will follow ending with Day 2 of Nitro Jam beginning at 7 p.m. and the remainder of Pro-Am eliminations immediately following. On Sunday gates will open at 8 a.m. with God Speed church service at 8:15 a.m. and one time trial beginning at 9 a.m. (time and weather permitting) followed by eliminations. Friday Qualifying – Sportsman racers will be given one round of qualifying Friday evening in front of the Nitro Jam audience. Saturday Nitro Jam – Sportsman winners during Saturday’s Nitro Jam/Pro-Am doubleheader will receive a special edition Nitro Jam Ironman plus an opportunity to compete in front of an anticipated capacity crowd. NITRO JAM: The 2013 San Antonio Nitro Jam presented by CarSafe and Good Vibrations Motorsports will feature Top Fuel Dragster, AMSOIL Prostalgia Nitro Funny Car, Fuel Altered, Nitro Harley, jet dragsters, jet funny cars, the Super Shockwave jet truck, wheelstanders, fireworks and more! FAST FACTS: The International Hot Rod Association has held events at San Antonio regularly over the past decade. It held national events there from 2003 through 2008 and again in 2011 through today…The winningest driver at San Antonio Raceway over the past five years is David Latino and Scott Ball with three apiece. Latino has visited four finals with three wins, all coming in 2011, while Ball had one win last year and two in 2011…Glenn Wright, Jeffrey Miller and David Bills have also been successful with three finals over the past five years with Miller and Bills collecting two wins and Wright one…A total of 19 different drivers have visited more than one final over the past five years…In 2012 Joe Collier and David Bills both doubled up at the Pro-Am/Nitro Jam double, sweeping Super Rod and Hot Rod respectively…Five of the seven 2012 division champions visited a final at San Antonio last year.